The guest house looks out over a very urban city. It sits between the old airport and a brewery down a bumpy dirt road. This is the place where most ELCA personnel are greeted if they venture to Yaounde Cameroon. It was my home away from home from Thursday until Tuesday when I moved into a small apartment in the Efoulan section of the city. I am still amazed how people find their way around here with no street signs and nothing that can be mapped on mapquest or a gps device. It reminds me of just how much we, from the west, take for granted. My apartment also has a view of the city from the porch. It is on the back side of the brewery about ten minutes away by taxi. Anne found me a driver name Vincent who will pick me up and take me where I want to go with a few hours notice. He drives a small Toyota and is a very careful driver. 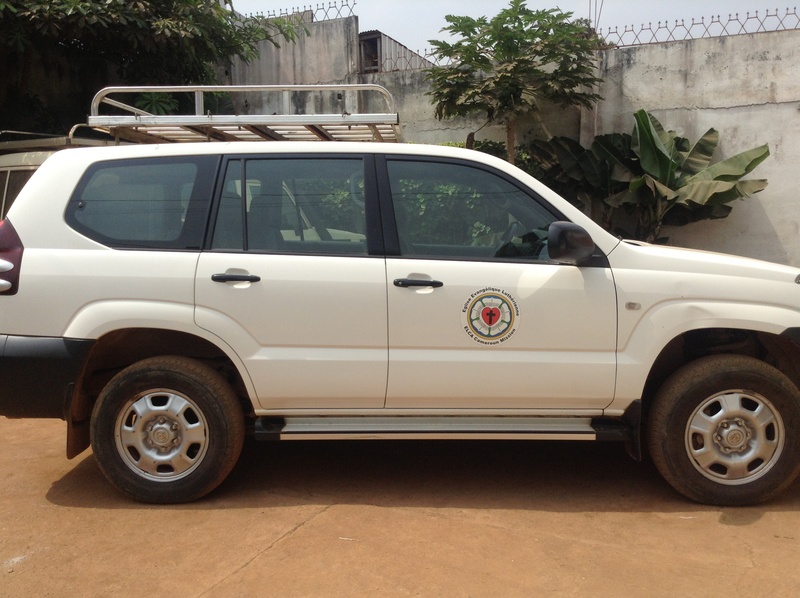 I am not quite ready yet to experience the normal mode of transportation in Yaounde, shared taxis. (I’ll write about that another day.) My uncle posted on my Facebook page and warned me to look out for the culture shock. I am way beyond that. Anne also found me someone to help with learning French and some of the culture shock. Il s’appelle Jean Roger. He is a twenty-five year old Cameroonian who has worked with the Peace Corps here in Yaounde for years. He is smart and very patient. At this writing, I have had fourteen hours of lessons, can introduce myself and recognize some phrases. I have paper taped all over the apartment so I might see, recite and remember some of what Jean Roger is trying to teach me. He is a delightful teacher who also explains the traditions, politics and problems in Cameroon. I have not only come to Cameroon to learn French but also to serve. My first Sunday here, I visited a Lutheran congregation with visitors from Wisconsin. There have been a few meetings with members of the Lutheran Church in Cameroon and the Lutheran Church in Central African Republic that I have sat in on. These churches, and the people are the reason I am here; to participate in the work of accompaniment with companion churches is what I have been called to do for Global Mission. I have also been privileged to meet a member of the EEL-RCA Rev. Dr. Antoinette Yindjara who is the first woman from the Central African Republic to receive a Ph.D in Theology. Meeting her and getting to know her will be one of the highlights of my time in Africa. She has surmounted obstacles and challenges, that we would not believe to obtain this degree. Yet, she does not wear these challenges. The one thing you notice when you meet Dr. Yindjara is that she has a ready smile and an engaging demeanor. I hope to have many conversations with her, me struggling with French and her with English. These are my first impressions of Yaounde Cameroon and my first impressions of Africa. Pray for me. I am westafricabound. 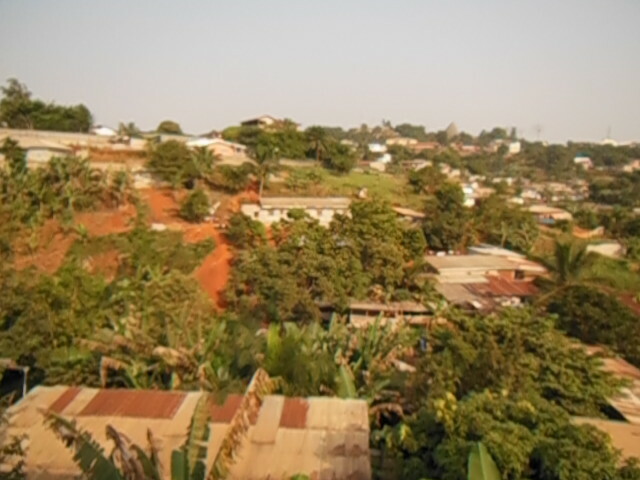 I arrived in Yaounde, Cameroon, which is actually Central Africa, around 7:25 p.m. Thursday. This was after about sixteen hours of travel: from Chicago at 6:00 p.m. on Wednesday to Brussels and from Brussels with a brief stop in Dauola and on to Yaounde. On the trip from Brussels to Africa I met a Swiss doctor who supervises the work of others in Yaounde. He spoke of the many people of goodwill he has met through his work and travels. Many of these people, he says, are volunteers and missionaries. I was met at the airport by two of these people of goodwill Anne and Willie Langdji. They picked me up in the official church vehicle to take me to their home which also functions as a guest house for ELCA visitors. First we had to report that my luggage did not arrive. I suppose it decided to have a short vacation in Brussels and will join me soon. At least I pray it will. Staying at the Langdji’s home at present are Deb and Joe Troester who are here because of their evacuation from CAR. I had a lovely dinner with them along with Keshie and Jackie, nieces of Willie, my first night here. I was happy to eat a Cameroonian style meal with manioc, plantains, grilled fish, greens and a very nice hot pepper sauce. It reminded me of the pepper sauce made over ten years ago by my former Togolese mother-in-law Carolyn Dagbovi, who I affectionately called Meme. I slept for the first time under mosquito netting. It is important to make sure you tuck in the edges of the net so that mosquitoes don’t get under it. Right now it isn’t a bad mosquito season. So, I am getting practice on how to secure myself under it. For my first few nights, I am staying at the Langdji’s but soon I will move to my own apartment that will be my “base of operations” until I go home. Monday morning is my first French lesson. So pray for me as I am westafricabound and officially on God’s excellent adventure! I am so glad that God knows, because you could not have told me last year this time that I would be about to take my first trip to Africa as an official representative of the ELCA, that I would be boarding a plane and flying out on January 16. This time last year, I was returning to my congregation after the holiday. Now, I am preparing to go to Africa. I will be in West Africa a total of three months. Much of that time will be spent in Yaounde trying to learn French. The territory that I am responsible for consists of Senegal, Central African Republic (CAR) and Cameroon where much of official church business is conducted in that language. Some working knowledge of French will help as I serve. In these three months, I will also travel to Sierra Leone, Ghana, Liberia and Senegal. Perhaps, I will get to Nigeria. I was hoping to visit CAR, but as you know there was recent rebellion. Things look better now. So who knows? I have so much to do, so much to learn. Since I began this new call on November 15, 2012, I have been reading files, books and internet articles about Central and West African countries. I am learning from Global Mission staff members and trying to get my head around all that this new call to serve entails. It was helpful to meet Anne Langdji. Anne is one of the ELCA Regional Representatives. She serves with her husband Willie; they live in Yaounde, Cameroon with their son Micah. She traveled to Chicago in December and was able to tell me much about what she does and how the ELCA is accompanying companion churches in the region. All of this has been part of the preparation and I am extremely excited to participate in this work. So far, I have gotten my immunizations including yellow fever which is a required vaccine to enter most countries in West Africa. I have also taken a round of oral typhoid and I have my malaria prophylactic. Collecting all the things that I need has been one of my main objectives. I have purchased sunscreen for the intense African sun, mosquito repellant with DEET as a layer of protection from mosquito bites; I have sent off for my Visa for entering the country and asked for an extra battery for my computer in case of power outages. I have set up Skype on every electronic device I have. I am even preparing my digestive track by eating probiotic yogurt. You laugh, but the preparations to travel and to fully serve in this capacity have been intense. I have always dreamed of visiting Africa and God has made the preparation. As God has planned, Africa will be a regular part of my life and work. Pray for me as I am westafricabound. “Get, out of bed, Jerusalem! When you see them coming you will smile–big smiles! Your heart will swell and, yes burst! This was good news for the exiles. The people were just returning to Jerusalem from exile in Babylonian Captivity. In a commentary, Dirk Lange writes, “In Jerusalem, a major conflict had arisen between those who remained and those who returned. Living conditions were extremely difficult. Jerusalem was in ruins. The people were now divided again not against some outside threat or enemy but among themselves.” (WorkingPreacher.org) Now the prophet comes with words from God. The prophet speaks of smiles, sunrise, brightness and light. This means their lives will turn around for the good. This is such a contrast to the darkness the Israelites have known, the darkness that we see so much of in our world. I’m still thinking about the situation in Central African Republic (CAR). Since December 10 the rebels have been on the move capturing one town after other. Like those in sixth century BCE Central African Republic is a country divided among itself. The issues of unmet promises, continued poverty and disappointment in how the government has run in the last ten years is, I suppose, a reason for this conflict. Mona, one of my friends sent me a message on facebook after reading my last blog post. She wrote, “your post sounds like de ja vu to me. At this time in 2003, I was on my way to take a call in Central Africa Republic. I had my psych evaluation, had my shots, was ready to transition . . . and fighting broke out and ELCA missionaries were evacuated.”Ten years, has anything changed? I am learning that the history of Central African Republic has been fraught with conflict. In 1960, CAR became an independent country after decades of colonilization by France. The transtion from colonial rule to indepedence began peaceful enough, but after six years a string of coups began. The last coup took place in 2003 when Francoise Bozize achieved the presidency. A historical report stated that his goals were to promote national reconcilation, strengthen the economy and hold elections. Yet, ten years later there is rebel uprising and unrest. Through out the bible there is unrest, war, conflict and violence and yet God is present with the people. We learn from Isaiah 60:1-6, that God does not wait for the people to get their act together, but comes. Yes, in the midst of our dark and broken world, God comes shining a light through the incarnation of a babe born to Mary. God comes, not as a result of our own actions, but insipte of us. To be certain, God is present with the people of Central African Republic even at this dark hour. At this writing, there seems to be a halt in the movement of the rebels, but the conflict is not over. Looking from the distance of my Chicago desk the fighting seems to be at a stand still. What will become of the peace talks that are to take place in Libreville, Gabon? Will the president hear the complaints of the rebels? Will the rebels take the advice of mediators? Will others be sent into exile? Exile, might be the word to describe the ELCA missionaries who were evacuated. There is the possibility that the lives of Susan, Jackie, Deb and Joe will take an unexpected turn if an end to this conflict is not seen, as my friend’s life did ten years ago. But what of the lives of the people of CAR who have been or will be displaced? What about those who will lose their homes and livelihoods if the fighting resumes. As you can tell, I am just learning about the people, and country of Central African Republic. What I glean from my learning is that violence and uprising, no matter the cause, is probably the last thing this country needs. Of course, violence is the last thing that any country needs. The smiles, sunrise, brightness and light, of God is needed. Sitting at my Chicago desk, as we enter the season of Epiphany I can only pray and ask for light to shine in CAR. We can only pray for God’s continued presence. Gracious God, be with the people of Central African Republic. Watch over those whose lives have been disrupted. Give the leaders wisdom. Imbue these leaders with a sense of fairness and justice. Help all involved in this conflict, government official and rebel, consider the people. Influence them with the love you have so freely given. Enable them to see the revelation of this love through Jesus the Christ. Let us as we pray to see the light at the end of the tunnel of rebel activity. And may we, in discussing this dark conflict, speak of God’s light and “preach the praises of God.” In Jesus name, Amen.